John Cheek looks back at the life and murder of Annette McGavigan, reflecting on the troubles in Northern Ireland, and the need for truth and forgiveness. It was an overcast afternoon and I sat in the back, as we were driven through some pleasant, suburban roads. Bumping up on the kerb, we parked just a few hundred yards from the Irish border. I was in the city of Derry, Northern Ireland; I was being taken to meet the cousin of one of my guides - and the former next-door neighbour of the other. We walked up the path of a pretty front-garden. Within seconds, the front-door was opening. A blond-haired lady with a strong Irish accent had been expecting us. We were shown through to the living room where tea, coffee and biscuits awaited us. I sat on a high-backed chair, opposite the settee, when I saw her. I'd noticed images of Jesus in the hallway. Now, I was facing a sculptured-image of the Last Supper, between two framed portraits of the same schoolgirl. One was an expanded, black-and-white photo of a fresh-faced girl with a happy smile. It was Annette McGavigan, believed to be the first child-fatality of The Troubles. 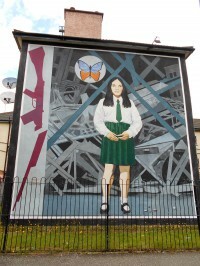 In her school uniform in broad daylight, on 6th September 1971 she was shot in the back of the head by a British soldier 100 yards away, with a high-velocity rifle in the Bogside area of Derry. Now, sitting opposite me, squeezed onto the settee was her younger sister, May Nicholls. I moved closer and positioned a recording-microphone in front of her, before everyone in the room. She was nervous and to put her at ease, I asked May to describe Annette. "She loved art, she loved music - I've got some of her school books. She even wrote poems. She was just an angel, really. She was really, really good and she enjoyed life: whatever life she had, until the day she was murdered. She was so kind. She would give you her last 2p to buy sweets with." I know about the appalling treatment metered out to Roman Catholics in Northern Ireland, then. Mass unemployment, unfair discrimination in housing and jobs, election rigging and other injustices were perpetuated by the Unionist establishment. Catholics were usually forced to live in squalid, tenement-like homes in areas like the Bogside. I asked May about her upbringing. "Good upbringing - in them days, everyone had big families and we managed, day-by-day. Life was basic, you know? A good upbringing. Even to this day, we keep asking questions - why her? Because she was the girl that everyone loved, even at school. Everyone loved Annette." I've read about that fateful day, when Annette finished her tea on that warm, late-summer's day and went out to look for coloured-stones for a school art project when a minor disturbance had taken place, nearby. Teenagers throwing stones and bottles at some soldiers. I ask May for her recollections: "Mammy came home from work. We had our dinner and mammy wanted some fruit afterwards - she wanted some for my sister Mena, after her dinner and I went down to the shops to get some: bananas. On my way back a girl I knew, she stopped me. She said, "There's been rioting over there and a wee girl's been shot." I thought how terrible that was. "I went straight home and my mammy was at the kitchen-sink. I said, "Mammy, there's been rioting and a wee girl's been shot." The words she said to me, were words I'll never forget: "God help her poor mother and father, whoever they are." Then Mena ate the bananas and went out. She didn't know at the time that it was our Annette, none of us knew anything. Then, Bishop Daly and a crowd of people just came up to the house. There was screaming and crying. Bishop Daly was talking to my mammy. We suddenly knew that it was Annette." Later, an inadequate and unsatisfactory investigation was carried out by the army into the killing of Annette McGavigan. Discrepancies between soldiers' testimonies have never been officially explored. No-one has been charged with her death. Furthermore, her already-devastated family would have the added distress of the army spreading lies that Annette was a "gunman," for the IRA. Over forty years on, I asked May if she harboured resentment towards the British. "Not the British - the English. I despise the English; just despise them. I have no time for them, because we know what they were capable of doing to innocent people." She said this to an Englishman whom she had warmly welcomed into her home. I gently asked this Catholic friend of Jesus if she could forgive her sister's killer. "No," was her calm response. However, I wonder if that position may change in the future, should the family ever be afforded the truth of what happened, that day. As Christians, we claim to follow the man who is the Truth. We're called to tell the truth, live by the truth, defend the truth. At a time when the legacy investigations look into The Troubles, we need the truth more than ever - however much it hurts, on all sides. The following Sunday, I recounted my experiences in Derry at the front, in church. After the service, a former soldier challenged me; he was angry. "So a young girl got shot - so what?" I couldn't believe what I was hearing. A fellow Christian, treating a human life with such little value? Whatever happened to Jesus' words, "Suffer the children to come unto me" and, "Love your enemies"? At this time, as a society, we need to look to the future but will fail to do so, until we face up to our past. It'll be painful - but the truth will set us free.